Described as “tall and stout” on his 1917 U.S. military draft registration, this large man survived brutal Montana winters; years of football contact; a German U-boat torpedo attack; being shot and gassed in France; and life in Chicago and New York City before taking his own life at age 41. Ralph Scott grew up in Wisconsin along the Mississippi River before his parents moved to Hardin, Montana, where he finished high school. He played on the freshman football team at the University of Wisconsin in 1916 and then on the varsity in 1917 while also being in the campus military cadet corps. On December 10, 1917 he enlisted in the U.S. army in Madison, was assigned to the 121st Machine Gun Battalion and was sent to France to join the 32nd Division. Sailing in a convoy of troop ships escorted by British destroyers, his ship, the Tuscania, was torpedoed by German submarine UB-77 just off the coast of Ireland on February 5, 1918. Although 210 of the 2397 crew and servicemen died before the ship sank, Scott was rescued and eventually reached France. While in France, Private First Class Scott repeatedly fought in battles from May to September. He was wounded in the foot in the Chateau Thierry engagement and later gassed on August 31, 1918. He was returned to America in January and discharged from the military at Camp Grant, IL on February 17, 1919. In 1920 he was a standout tackle on the 6-1 Badger team and was a Walter Camp first team All-American selection. During the 1919 and 1920 collegiate seasons he played against future Staleys’ and Bears’ teammate Ed Sternaman and future Bears’ teammate Laurie Walquist from the University of Illinois and future Staleys’ teammates Pete Stinchcomb and Chic Harley from Ohio State. The following fall he was recruited by the newly formed Green Bay Packers but instead came to Decatur on the morning of October 5, 1921, signed a contract with the Staleys and was on the practice field that afternoon. The Staleys’ publicist reported that Scott was rated “as one of the best linemen in the history of the grid game. He weighs close to 220 pounds, is fast on his feet, and a heady aggressive player. He will hold down the left tackle berth on the Staley machine this season.” In his only ever game in Decatur, Scott started the following Monday in a victory over Rock Island in the last pro game ever played on Staley Field. The following week the Staleys moved to Chicago and Scott started the other ten games and even scored a touchdown as the team won its first national championship. In 1922 George Halas and Edward Sternaman created the Chicago Bears franchise in the new National Football League. 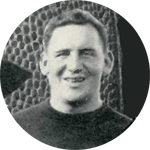 Playing mostly tackle on both offense and defense, Scott started 35 of the 56 games he played for the Bears from 1922 through 1925. In 1926, Red Grange’s agent Charles C. Pyle created the American Football League after a dispute with the NFL over the terms of granting him a league franchise in New York City. Pyle hired Ralph Scott as player-coach for his newly-formed Yankees football team which featured Grange as the main draw. At the same time, former Bears’ quarterback Joey Sternaman created the Chicago Bulls AFL franchise. When the Yankees came to Chicago the former 1925 Wrigley Field teammates opposed each other on October 17, 1926 as Sternaman’s Bulls defeated Scott’s Yankees at Comiskey Park. The AFL folded after just one season but Pyle was able to get the Yankees accepted into the NFL with both Grange and Scott on the team. In his last year in professional sports, Scott’s Yankees lost to the Chicago Bears at Wrigley Field in front of 25,000 fans as Joey Sternaman was back playing for Chicago. Scott finished his professional coaching career with a record of 17-13-1. It is unclear as to what Scott did for the next several years. By 1930 he was living with family back in Hardin, Montana and doing some coaching. In the fall of 1934 he worked as line coach for the Bobcats at Montana State College in Bozeman. In August 1936 Scott suffered from what the doctor considered a sinus infection. His family was especially concerned because Ralph became “delirious” at times during his illness. On the afternoon of Saturday, August 15, Scott “slipped out of the house and disappeared.” He was found the next day sitting in his automobile at the Hardin airport with a hose running from his car’s tailpipe through his rear window. His death from carbon monoxide poisoning was the second known suicide [see Sidney Gepford 1924] of a former Staley football player. Army veteran Ralph V. Scott was laid to rest at the Custer Battlefield National Cemetery, Big Sky County, Montana on August 17, 1936. A special thanks to the archivists and athletic staff at Montana State University – Bozeman for their help.